Known at home as Bo, Mr Lund said the bull had produced some “marvellous” heifers, including another past Skipton champion. Out of a British Blue cow, the 535kg victor also achieved the day’s leading price of £1,356, or 253.5p/kg, when joining regular butcher buyer Richard Binns for his shop in Bingley Road, Saltaire. Mr Lund became CCM’s Farmer of the Year after gaining most points in an annual awards scheme that recognises the contribution of regular vendors at Skipton Auction Mart. Points are awarded for both prize winners at livestock shows and highest priced stock in several categories at weekly sales throughout the year. Mr Lund, whose family has farmed at Walshaw, part of the Saville Estate, since 1962, sells both prime cattle and lambs at the North Yorkshire venue. Anthony Thompson, of Foulridge, presented the champion pen of five three-quarters bred 42kg Beltex prime lambs, which sold for top call in show of £100 per head, or 238.1p/kg, to butcher George Cropper Jnr in his new role in the butchery department at Huntley’s Country Stores in Samlesbury, Preston. The Whalley Road farm shop was taken over in June, 2012, by local farmers and agricultural contractors Harry and Lynn Wilson, of Samlesbury, who have successfully embarked on the journey to rebuild and rebrand the well-known business, a former East Lancashire Retailer of the Year. As well as a traditional butchers shop, Huntley’s also has a restaurant, delicatessen, bakery and other retail outlets. The farm shop is renowned for sourcing locally produced lamb, beef and pork, a policy new butcher Mr Cropper, who lives in Baxenden, said he was committed to both following and developing. Mr Cropper was making his first acquisition at Skipton Auction Mart on behalf of Huntley’s and said he was single-minded in his desire to start with the best by acquiring the champion prime lambs. “We can trace all our meat back to the farm and where possible this will be a local Lancashire farmer in support of our regional agricultural communities. 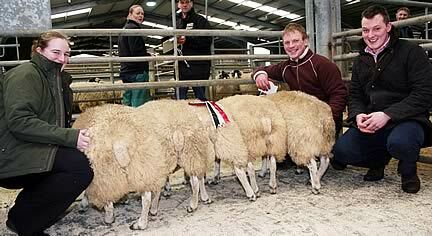 The Skipton title winners were bred and reared in Lancashire, so I was determined to buy them,” he explained. The title winners will be on sale at Huntley’s Country Stores from this weekend. (Feb 9/10) The business sources the vast majority of its meat through Bowland Foods in Preston, a regular buyer at CCM Skipton. Back with the prime cattle, in the under 30-month classes two Blonde-cross heifers from Roger Wood, of Cross Roads, Keighley sold well at £1,323, 203.5p/kg, and £1,223, 216.5p/kg. Both fell to James Dewhirst, buying on behalf of Stanforths Butchers in Skipton. A Limousin-cross bullock from John Beckwith, of Gargrave, made £1,235, 237.5p/kg, when becoming yet another Skipton acquisition by Keelham Farm Shop in Thornton, Bradford, while another four figure achiever was a black and white heifer from Threshfield’s Angus Dean, which made £1,223, 167.5p/kg, on joining John Thompson, of Preston. Of the 30 to 48-month entries, an Aberdeen Angus-cross heifer from John Marshall, of Dacre achieved the leading per head price at £1,274, when selling to Gargrave’s John Thompson, while a by-weight high of 204.5p/kg, or £1,115, fell to a Limousin-cross heifer from GD&A Midgley, of Ludendenfoot. The buyer was Halifax meat wholesaler Gerald Medcalf. The overall selling average for the age range was £970.20, or 146.07p/kg. The 71 prime cattle forward included a 40-strong contingent of cast cattle, which featured in a standalone show, when the champion, the first prize beef-bred entry, a Limousin-cross from John Shorrock, of Cliviger, Burnley, made top price by weight at 160.5p/kg, or £1,107, when also joining Gerald Medcalf. The red rosette-winning and reserve champion dairy-bred entry from M&RM Holmes & Son, of Addingham, sold for £867, or 128.5p/kg, to Kepak UK in Wakefield, though it was the second in class from G Abbott & Son, of Dacre, that headed the cull cow prices at £1,284, 134.5p/kg, when falling to Dawn Meats, of Carnaby. 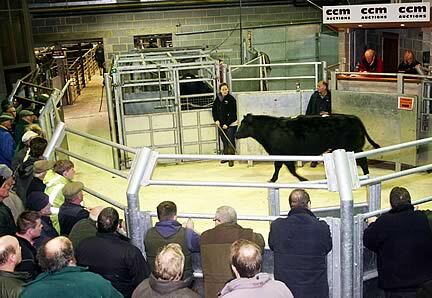 The overall selling average was £768.70 per head, or 119.86p/kg. A total entry of 3,383 prime sheep was larger than anticipated and met with improved trade some 12p/kg up on average on the week at £61.45 per head, or 152.75p/kg. The smarter end sold from 180p/kg upwards, with commercial export hoggs a lot dearer on the week, some as much as 20p/kg higher, with 165-175p/kg commonplace for better Continental and Suffolk-cross Lambs, while plainer export weights were 155-160p/kg. Hill hoggs were also much better to sell. Mules, in particular, were a lot sharper on the week, with 40-44kg entries £18 to £22 over the weight at around 145-150p/kg, while lightweight Mules were 130p-140pkg, averaging 142p/kg overall. Horned wether hoggs also found a ready trade, some 15-20pkg dearer on the week. In the show classes, the second prize pen of 38kg Beltex-cross Continentals from Procters Farms, of Slaidburn, sold for £85 per head to Vivers Scot Lamb, of Annan, who also paid £82 each for the third prize Beltex pen from Oxenhope’s Stephen Pepper. Regular prime lamb purchaser Andrew Atkinson, of Felliscliffe, was again active when securing a number of prize-winning pens – among them the first and second prize Suffolk-cross consignments from CD&RF Kitching, of Threshfield, and TR Thwaite, of Horton-in-Craven, at £70 and £68 per head respectively, and the first prize pen of Mules from Roy Nelson, of Bordley, at £64.50 each. Yorkshire Halal Meats again sourced prize winners for its supermarket in Alice Street, Keighley, including the first and second prize Swaledale pens from, respectively, Calton’s Robert Crisp at £66 per head and Bernard Simpson, of Pateley Bridge, at £63. Mr Simpson also chipped in with the second prize pen of Mules, sold for £66 per head to JW Bowling, of Ashton-in-Makerfield. JW Barker & Son, of Airton, presented the third prize and top price Suffolk pen, which became a £75 per head acquisition by wholesale butchers Riley Bros, of Dunnockshaw. Woodhead Bros Butchers in Colne paid £64 each for the third prize pen of Mules from Rita Heseltine, of Summerbridge while the third prize Swaledale pen from RG Church, of Askwith, sold for £59.50 each to Hellifield’s Paul Watson. Cull Sheep were around £5 each dearer on the week when averaging £53.89 per head, selling to a top of £119.50 for a pen of four Suffolk-cross ewes from Andrew Atkinson. Cast rams sold to a high of £84.50 for a Texel from J Lord, of Littleborough. The larger offering of 81 rearing calves met with mixed trade, though some exceptional youngsters from three vendors - Geoff and Margaret Booth, of Lothersdale, JP&KE Hartley, of Bolton Abbey and Robert Metcalfe, of Brearton - boosted the overall per head selling average to a shade over £198. The leading performer at £400 was a British Blue-cross bull calf from the Hartleys, sold to Tony Binns, of Clint, Harrogate.